Cycle Time: +/- 1.0 sec. Bench Space: 1.5 sq. ft. 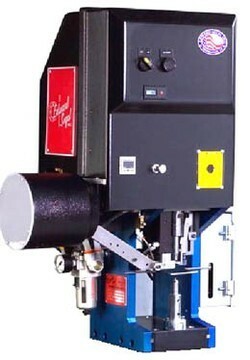 The Edward Segal, Inc. Model 512 is the most unique machine of its kind. This machine combines dynamic feeding and tooling innovations with modern technology; it offers whole new approach to riveting! The 512 series handles a broad range of rivet sizes, but the value-added is most apparent for applications where it is critical to control the setting force or fast changeovers are required. A 512 is primarily designed for semi-tubular rivets up to 1/8” diameter, but more powerful versions accommodate up to 1/4”. Component Feed System — The versatility of the 512 is unparalleled when it comes to the wide variety of parts that it can feed. Unlike many other dedicated hoppers or vibratory feeders, the feed system for the 512 is very flexible. A universal hopper tumbles any part the 512 can feed and the rail assembly can be changed to accommodate a wide variety of part designs. Snap-Out Tooling — The jaw and driver for the 512 require no tools to change-out. Both parts are held tightly in place with ball detents. The unique one piece jaw requires no adjustment of jaw springs, ever. Once snapped in place, the jaw is properly aligned. Quick Changeover — The rail assembly is located and secured with a single screw and the anvil is held in place with a single set screw. Imagine the possibilities of being able to take the machine set-up for a rivet and convert to an eyelet or a threaded insert application in less than 5 minutes, all without having to absorb the cost of a second machine! Pressure and Speed Controls — The 512 protects your assembly components by controlling the force placed upon the parts. This feature disables the setting force once a predetermined pressure is achieved. Additionally, the pneumatic controls facilitate speed adjustment for the cycle, allowing the 512 to run at the optimum speed for every application. Programmable Logic Controller — Most machines available are designed for full stroke, single purpose applications. PLC based control is yet another feature that establishes the 512 as a new standard for fastening and insertion machines. These controls support higher level applications that may include the use of vacuum, part presence sensing and motion control. All of this can be added without a significant change in the design or cost of the machine! Safety — Operator safety is a paramount concern for every manufacturer. The 512 comes standard with either a safety ring guard or double palm buttons, but can also be integrated with just about any customer specified device.